BBST Bug Advocacy – Completed & Passed! 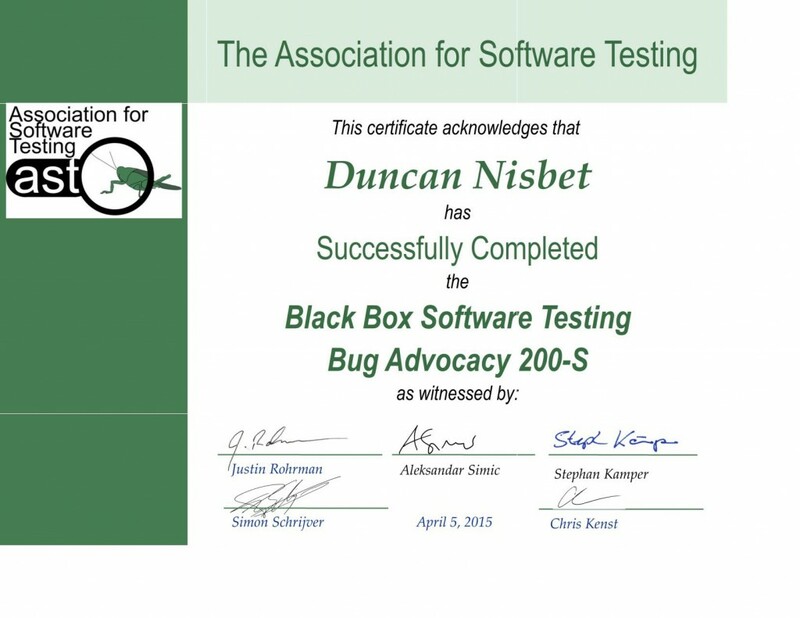 Back in May, I sat & successfully completed the BBST Bug Advocacy class from the Association for Software Testing. This was a fabulous class & really stretched my grey matter. I found this class far harder than the Foundations & I’m not entirely sure why. My beliefs about bugs (& testing in general) are more ingrained than they were back in 2012 and as such breaking down & rethinking those beliefs was a lot more painful. I didn’t build as strong a rapport with the other attendees of this class as I did with the BBST Foundations (that’s on me, by the way). I wasn’t working at the time – I thought the “downtime” would permit me more time to spend in the class. Unfortunately for the class (fortunately for me), I didn’t have a much free time as I was hoping for. Still, it was a deep & valuable class with some great discussion & facilitation. I’d like to thank all those in the class with me & the facilitators (who put their time up voluntarily).